Since MSP admitted its first cohort in 2003, more than 100 students have completed the Museum Studies Certificate. The chart below includes information on the current placement of the 88 MSP Certificate graduates who have also completed their Masters, Ph.D., MFA, or J.D. degrees. Students enter the MSP certificate program with many different interests and career goals. 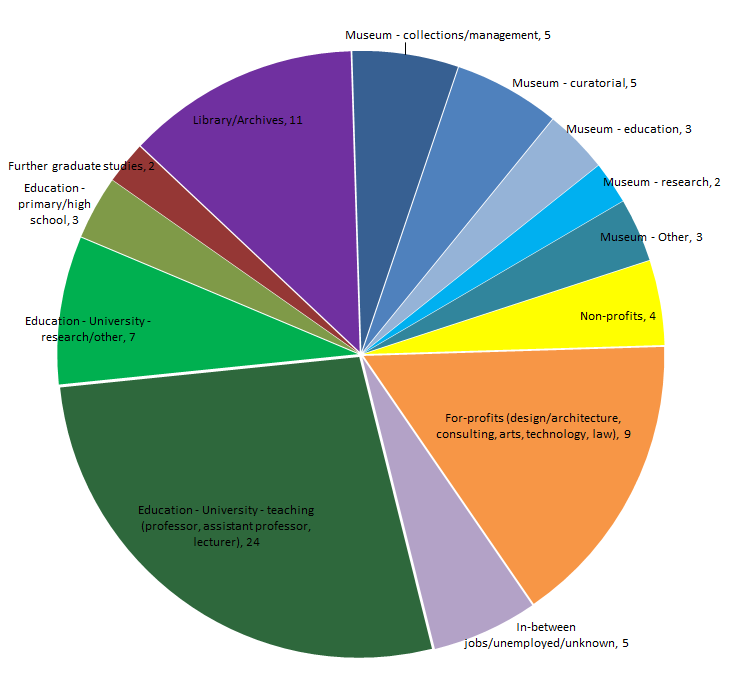 Some seek careers in museums; some in academia; and others in K-12 education, libraries and archives, non-profit art organizations, and for-profit companies and firms. Whatever their goals, students have found pursuing the certificate a rewarding and productive experience that has helped them to clarify and prepare to meet their career goals. Today, 26 of our graduates hold teaching appointments in universities; 16 work in a variety of capacities in museums; and 8 are employed in libraries or archives. See more comments about how the Museum Studies program enhanced the professional lives of our alumni. Alicia is a curator at Olympia Entertainment in Detroit working on exhibits for a new hockey arena. Caroline is the Accessibility Coordinator at The Henry Ford. Marisa is the Assistant Registrar at the Detroit Institute of Arts. Shannon is Director of the Abrams Planetarium at Michigan State University. Julie is the Citizen Science Education Coordinator at the Adler Planetarium.